I am expanding this ‘cartoons referencing art’ theme further to include literary works. Today it is a cartoon by Martin Rowson referencing the poem Ozymandias by Percy Bysshe Shelley. Percy Bysshe Shelley – first published in the 11th January 1818 issue of The Examiner, London. The central theme of the poem is exploring the arrogance of leaders and contrasting the inevitable decline of all of them and of the empires they build with their pretensions to greatness. 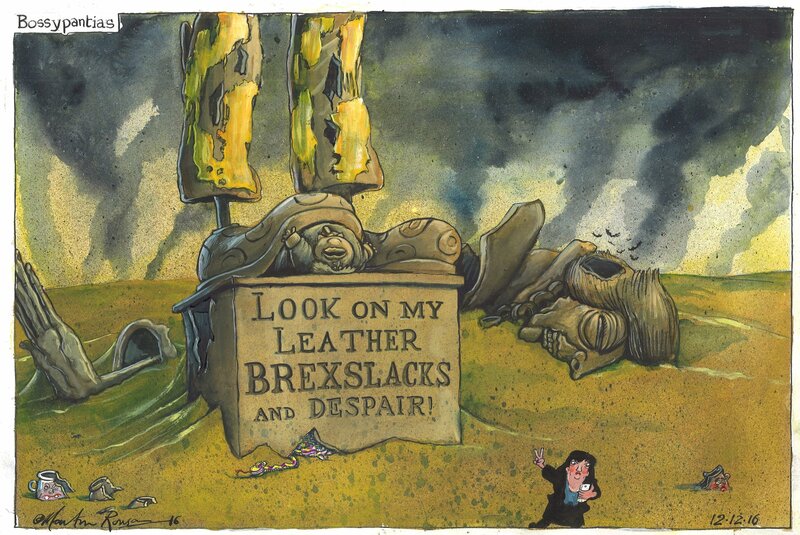 In Martin Rowson’s cartoon we can see that “Two vast and trunkless legs of stone, Stand in the desert. Near them, on the sand, Half sunk, a shattered visage lies” – obviously representing Prime Minister, Theresa May. The main story behind this is the exclusion of Nicky Morgan from a private meeting with the Prime Minister after she had made comments about the PM wearing a pair of £995 leather trousers for a photo shoot. This was after an extraordinary text spat with Mrs May’s joint chief of staff Fiona Hill. Hill ripped up Morgan’s No 10 invitation after the MP publicly criticised the said trousers. Hill then texted to Morgan: ‘Well, he just did. So there!’ – believed to be a reference to Burt having taken her to the previous meeting. One Tory MP said: ‘For Downing Street to ban Nicky from the meeting just because she made a mild remark about the PM’s trousers is appalling, absurd and will backfire. ‘Some people in No 10 are acting like a medieval monarch’s courtiers, not responsible civil servants in a modern democracy. Mrs Morgan has been an outspoken critic of the Government after being sacked from her Cabinet position when Mrs May’s took over at Number 10. The cartoon shows Nicky Morgan walking away flicking two fingers to May while, in reference to the Boris’ “proxy wars” controversy, the foot of the demolished statue is stamping down on him. Mind you she is known for being a “Bloody difficult woman”. But is she, as some Tory critics think, getting too big for her kitten-heel boots? This entry was posted in Referential Cartoons and tagged Boris Johnson, Martin Rowson, Nicky Morgan, Percy Bysshe Shelley, Theresa May on December 12, 2016 by Chris Walker.